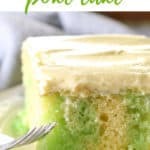 A refreshing lemon lime jello poke cake made with boxed cake mix, lime jello and topped with a homemade lemon pudding dream whip frosting. Everybody likes cake. Well, maybe not 100 percent everybody, but there’s enough people in the world that like a good cake to make jello cake – and make it well. 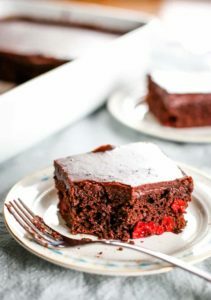 But with all the box mix opportunities that stare at you from the grocery store shelves, it’s hard to know how to make a cake unique – moist and amazing, while at the same time harnessing the ease of the box mix. 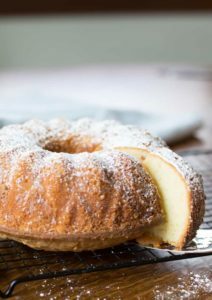 By the way, this moist lemon cake recipe is also amazing! This unique yet amazingly moist cake has all the things. It has the slight tartness of lemon (thanks to the lemon box mix) and the sweetness of lime. It’s not a super tart jello cake (don’t think key lime pie) but still is refreshingly light. My grandma called it summer cake because of the flavors. 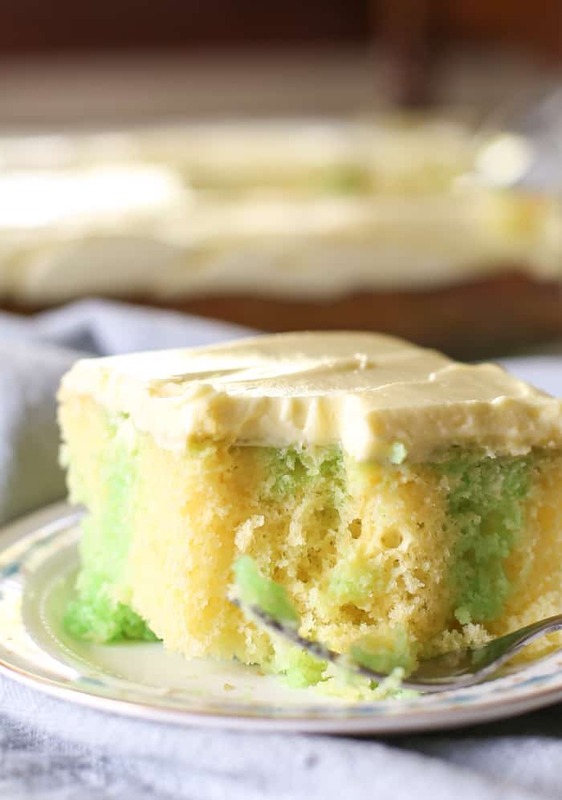 I think this lemon lime jello poke cake can be made at any time. All the time. When that sweet tooth hits, this is the cake. 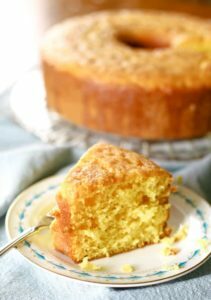 A poke cake is a cake that you poke and fill with a unique filling like this lemon poke cake I’ve shared before. In this case, we’re taking a lemon cake mix, baking it and then poking it. Into the poke holes goes a lime jello. It’s super easy to do and I that the jello takes it to a new level of flavor and moist-ness. I use the handle of a small spatula. You want something that’s wider than a toothpick, but more narrow then a typical handle you’ll find in your utensil drawer. For me, that comes in the form of a small spatula I had on hand. Once you have your tool of choice, you want to poke the fully baked and slightly cooked cake, with the handle. Each hole should be about 1 to 2 inches from each other. Make the cake following the lemon cake mix directions. Fill the poke holes with jello. 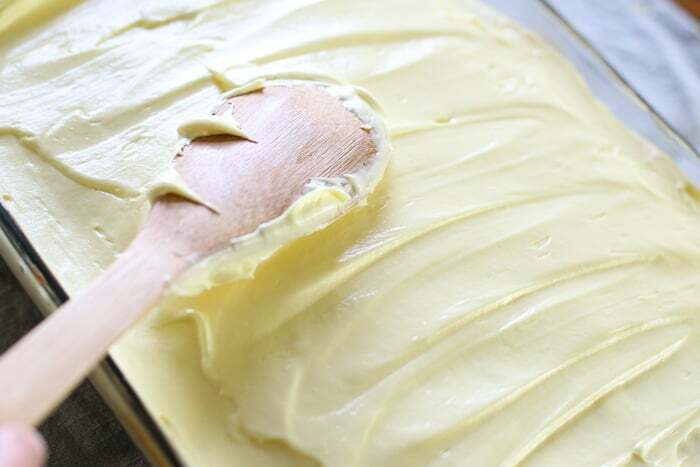 While the cake is setting in the refrigerator, make homemade frosting. Frost the cake – and enjoy! What I like about this cake is that it’s super simple to make and is topped with a delicious pudding frosting that is fluffy and light. My grandma called this a refreshing summer cake. I agree. It’s refreshing, but I don’t think you’re limited to summer with this cake. It’s like sunshine in a cake pan – and we can definitely use sunshine during any season – especially the fall and winter here in Ohio. 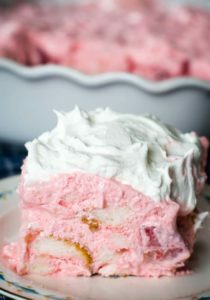 So, whether you need a unique dessert for your next potluck, or you’re making a refreshing cake for your family. 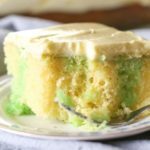 This lemon lime jello cake – is the way to go! 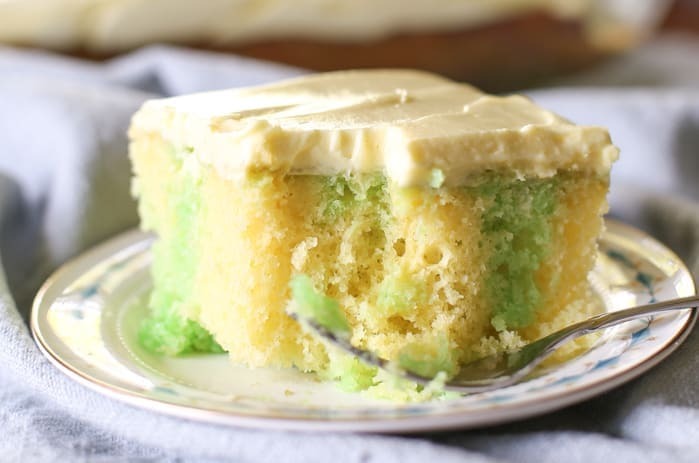 A refreshing lemon jello cake with lime jello filling. Topped with a lemon pudding dream whip frosting. Preheat oven according to cake mix directions. Grease and flour a 9×13 glass baking dish. Bake the lemon cake as directed. Cool cake for 20 to 25 minutes. While cake cools make the jello. Combine lime jello and boiling water. Once jello is dissolved add cold water. Cool to room temperature. 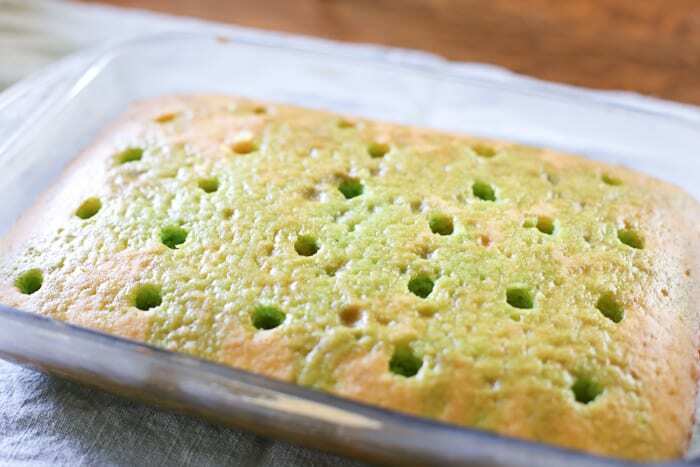 Poke holes into warm cake and pour cooled jello over the cake. Refrigerate. 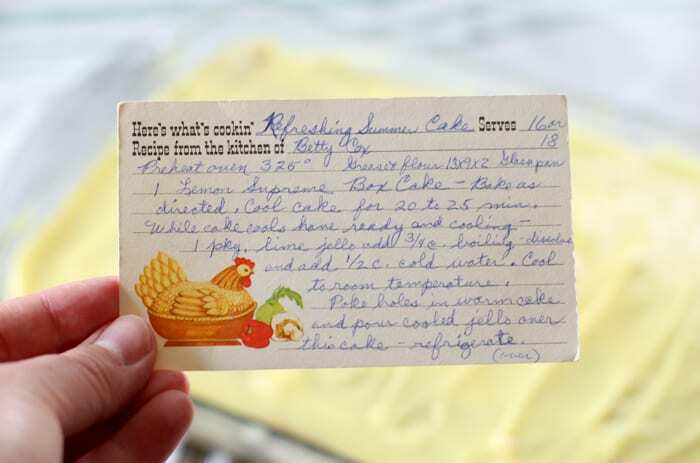 Once cake is cool, make the frosting by beating lemon pudding, dream whip and cold milk. Spread over the top of the cake and refrigerate. This cake can be made the day ahead. It also freezes well. If freezing the cake, take out of the freezer the morning of your event to allow for at least 8 hours to thaw on the countertop. It will take 3 to 8 minutes to beat the frosting until it is thick and creamy. In the directions step 5, you say to mix pudding mix, dream whip and cold water. I think you mean cold milk, although there is cold water in the ingredients, but that is used with the jello.